I’m a big believer in setting goals. Personal. Professional. Spiritual. You name it. I firmly believe you stand a much better chance of getting somewhere if you know where you’re trying to go. Goals have been a huge part of my writing life. I wrote my first published novel, Under the Never Sky, by sitting down exactly seven years ago and planning twelve-months’ worth of targets. Without an editor to establish deadlines, I took on that role myself. I bought a calendar and projected drafting and revision goals that were specific and realistic. I had a good idea by then of my average productivity so I created milestones I felt pretty confident I could meet. And I did. It wasn’t always perfect. Some months I fell behind. Others I surged ahead. But having those targets—and hitting them—was tremendously encouraging. Big things are accomplished in small steps. 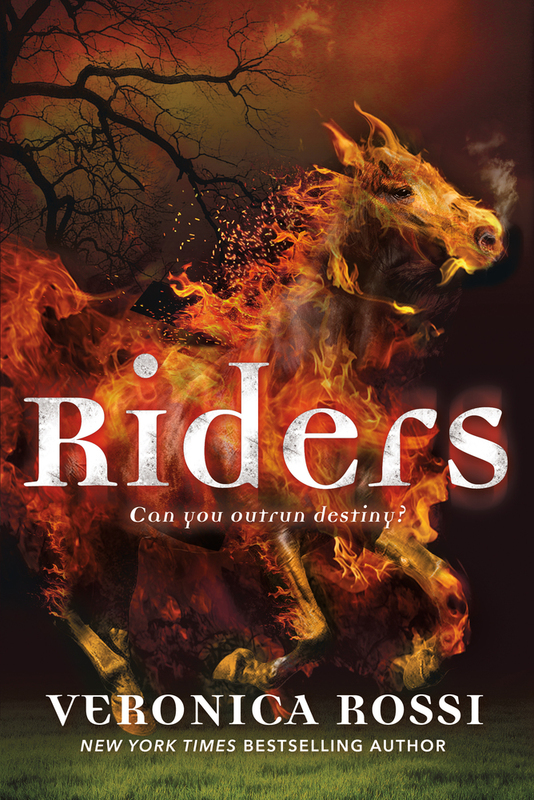 My second YA series begins with Riders. It’s a modern-day fantasy about four teens who unwittingly become incarnations of the four horsemen. These poor guys—War, Death, Famine, and Conquest—do not want to be what they’ve become but the only way to change their situation is to complete a mission. With the help of a visionary girl, they must protect a sacred object from some truly bad baddies. Riders, which releases on February 16th, was written in a similar process as Under the Never Sky. Take out the scope. Focus on the summit. Project distance and elevation. Plan the route. Prep the materials. And go. If you stick to a plan, you can write a solid draft of a book in a year. Really. Answer the “Why” — My husband recently read Start With the Why by Simon Sinek, based on his TED Talk of the same title. Though I’ve only seen the latter, we’ve been having many discussions about the central tenet of Sinek’s argument. Though it’s primarily geared toward business-minded folks, Sinek poses a question that he believes everyone should consider: What’s your Why? Why do you do what you do? In my case: why do I write?I honestly thought it would be an easier question to answer. After all, I’ve been writing seriously for a dozen years now and I love writing. However to truly answer that question requires some honest soul-searching. Do I write to understand myself? To understand the world? To inspire others? What, specifically, is the desire that pulls me forward, book after book?Most writers are familiar with the story premise or logline. Usually a formula that goes something like: Character does X despite facing Y obstacles in order to achieve Z goal. But what’s my logline? Why does Veronica write in the face of deadlines, writer’s block, etc. to achieve novels? I want to understand the true nature of the force that propels me to tell stories. Sinek explains that we attract people who have similar Whys. That is, whatever it is that motivates me is the very thing that aligns my readers with me. So. By having a firm grasp on my Why, I think I’ll be able to write even better stories and more fully enjoy my work. As I said above, when you know where you want to go, you have a much greater chance of actually getting there. Step Away From the Computer — I took a month away from the Internet last summer and it was glorious. Seriously. It had an undeniable impact on my mood and my creativity. I was more relaxed. My focus improved. Even my imagination. I plan to do another month-long break this year.In addition to that, I’m going to spend more time working in notebooks. Not just journaling, which I already do, but writing. I started this recently and was shocked to find that my hand grew tired after only a page or two! Scary. But I’ve also found that I take greater care in crafting sentences when I put pen to paper. It causes me to slow down, to think. That’s a great benefit. I make my trade by creating good ideas and sentences—so anything I can do to improve on them is absolutely a priority. Learn! — A dear writing friend of mine and I have been scheming for the past few months about the classes we plan to take this year. Poetry. Screenwriting. Short stories, maybe? Gasp! Perhaps. If we’re bold enough. We both always want to improve as writers so we’ll be taking online classes that push us out of our comfort zones, right into the growth zone! Expand Horizons — Before I became a novelist, I was an oil painter. I spent a few years painting commissioned works as my profession. While I’m not sure I’ll go back to painting, I do want to bring another outlet into my life—and it doesn’t necessarily need to be creative. I started running last year and that had a strong positive impact on me. Like painting, running provided me with “non-thinking” time with no no room for email, Twitter, daily chores, or anything else.This goal ties in with the social media break I mentioned above. Too much external input can actually bring me to a point where I don’t even hear my own thoughts anymore. Through these “non-thinking” activities, my subconscious mind gets to stand up, stretch, and step into the spotlight for a while. With every passing year I see the importance of this increase. Making a practice of mental “quiet time” is critical for my creative health. Be Patient — I’ve been writing on deadline for the past five years. Hustling. For five years. Even before that, when I was trying to get published, I felt this tremendous impatience to hurry things along. I wanted the agent so I could get the book deal so I could publish a book so I could be published so I could…?Write! Write more, of course! It’s what I love to do. It’s a circular deal. I didn’t realize that for a long time, but writing is the work and the reward—so why rush? A good friend of mine has a great way of describing it. He says: Writing to get published is a pie-eating contest where the prize is more pie. So, my goal is to take my time. Make a great pie. The best one possible. The writing is the reward. So, in addition to revising the sequel to Riders, those are some of the things I’ll be working on this coming year. I think they all fall under the umbrella of being more thoughtful and connected to one of the great passions in my life. What are some of your goals, writing or otherwise? What’s your Why? Follow Veronica Rossi on Twitter at @rossibooks, on Facebook, and on her website. This is a great post, Veronica. Your central question–Why?–is one I’ve just begun to struggle with. I asked myself that question as an author really for the first time last year, and I’m still not sure I have an answer I think is totally right. I write because I love to write, like you, but why am I telling the stories I choose to tell? The best answer I’ve been able to come up with is that I want to open up new worlds and new perspectives to my readers. I want to help my readers empathize with a viewpoint, an experience, unlike their own. That’s the deep, meaningful answer. But I also want to entertain, and though that’s not a “deep thought,” I think it’s still an important one. So some mix of that, I suppose, for me. Alan, we should keep each other honest on our writing schedules! 😉 Looking forward to seeing you soon! I’m not big on goals for myself. They make me suddenly feel forced and then I rebel…against myself. If I’m happy I, by that I mean not depressed, I can write. Editing, however, is a whole other animal. I think the thing is knowing what works for you – and doing that! Good luck with both your writing and editing! I have a distinct memory of wanting to be a writer early, like second grade. I wrote a story for class and the teacher liked it so much she had the pages laminated. That story sits on my bookshelf next to where I work. But I didn’t have the courage to learn how to write until I was 28. I had a career and a life that exploded and I thought, “I used to love writing. I’m going to take a class.” I was terrible. Words came out like cinderblocks and my sense of story was odd. Despite sucking at it I loved the often arduous process of writing, the figuring things out not only as a craft but who these characters that came to me were. I started with short stories and essays. I took class after class and even went on a writer’s retreat in France. I got better. My stories and essays were published. I decided to try to write a book. I realized my heart was in YA. And I began writing that. And now I’ve written two books. I may not be on bookshelves yet (querying now so please cross your fingers for me) but I can’t imagine not writing. Not only does it give me sense of purpose, but it unleashes a creativity that when left inside, makes me a fidgeting mess. It’s a job I am a million times dedicated to and those short term goals I set for writing lead to long term goals. I hope somehow what I put on the page will touch a reader and help them feel something that’s inside that they can’t name or want a companion to face. My fingers are very crossed for you! Keep going! You can do it! Must say, I love the pie analogy! And pie! Goal oriented writing . . . I’ve always been goal driven: school, career, personal achievements. But with writing it’s hard to look beyond the ultimate goal: getting published. I, like you, want to enjoy the pie. I think setting writing goals and being able to reach them will not only foster more enjoyment in the craft, but maybe unload some of the doubt and burden the ultimate goal imbibes. Horizon expansion: I feel like I’m constantly drafting blueprints for some big horizon remodel, but the contractors keep upping the quote, and I’m left with a bill I can’t possibly cover. Doubt. Again. Ugh! Thank you for the great tips, and the even better stories! Looking forward to Riders! Hi!! I definitely understand the doubt! I wrote for around seven years, in a quagmire of doubt, until I sold my first manuscript. I remember going to bed every night, staring at the ceiling, wishing for a shot… It’s so hard to work in that place of uncertainty. But, I’m not kidding, the doubt only shifts around a bit as you get further along in the process. You worry about different things, but you still worry. I guess because we care, and it’s art, and… Well, we CARE! Anyway, keep at it. Work hard. Keep improving your craft. You’ll get there! You have some amazing writing goals and dedicated orientation! I’ve always run into personal issues with setting goals. For myself, whenever I’ve set writing goals and don’t make them, I feel like a failure. I definitely need to find more ways to make it all work in harmony, much like you have. Thanks for all the advice. Can’t wait for RIDERS!